Val Gardena is part of the Dolomites in the province of South Tyrol It stretches from Ponte Gardena to the Sella and the Gardena Passes and is part of the linguistic area of the Ladin people, also called Rhaeto-Roman people. The actual Val Gardena valley starts in Pontives where the valley opens up. Further up the valley are the villages of Ortisei, S. Cristina and Selva. 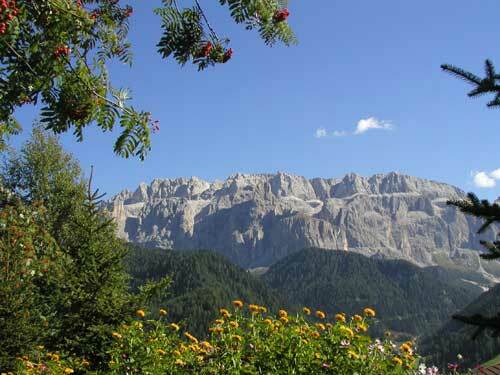 Val Gardena is surrounded by a beautiful mountain landscape: the Odle, Puez, Sella and Sassolungo groups. Val Gardena is known worldwide as a tourist area: whether for skiing, snowboarding or cross-country skiing in winter or for mountain climbing, hiking or cycling in summer. Here it is easy to combine nature with leisure and to spend relaxing days. Val Gardena is famous for its traditions and much visited for its woodcarvings. Crib figures, sacred as well as profane , are offered in many souvenir shops and specialized woodcarving workshops from Ortisei to Selva. Nowadays wooden gifts are much in demand and appeal to young and old alike.